Robbie Brady got the Republic of Ireland off to a dream start as they threatened to dump hosts France out of Euro 2016. The Norwich midfielder, whose goal against Italy had secured their passage to the last 16, gave Ireland a second-minute lead from the penalty spot after Shane Long had been barged to the ground by Paul Pogba. France dominated the first half thereafter, but although goalkeeper Darren Randolph had to save from Dimitri Payet, Antoine Griezmann and Pogba, he was never over-extended. Martin O’Neill named an unchanged team as the Republic of Ireland looked to dump hosts France out of the Euro 2016 finals and claim a quarter-final berth. Full-back Stephen Ward shook off the ankle problem which has threatened his participation to allow the manager to field the same 11 men who started Wednesday night’s 1-0 victory over Italy. France boss Didier Deschamps reverted to his strongest starting line-up as N’Golo Kante, Blaise Matuidi, Dimitri Payet and Olivier Giroud came in for Yohan Cabaye, Moussa Sissoko, Kingsley Coman and Andre-Pierre Gignac. After that dream start from Brady, France quickly poured forward in search of an equaliser, with Ireland keeper Darren Randolph relieved to be able to get both hands on club-mate Dimitri Payet’s eighth-minute free-kick before Antoine Griezmann headed over from Pogba’s cross seconds later. Central defender Shane Duffy needed every inch of his sizeable frame to prevent Giroud from reaching Griezmann’s 12th-minute cross with France attacking in waves, and the wide-man forced Randolph into another saved with a glancing header from Payet’s free-kick six minutes later. Lloris had to dive full-length to deny Murphy his first senior international goal with 21 minutes gone, but Randolph had to save from Griezmann and Pogba in quick succession with the pressure almost relentless. Ireland were sitting deep as they attempted to deny the French space in behind, but with Kante allowing Matuidi and Pogba to link with the front three, the danger signs were there. Kante’s afternoon took a further turn for the worse with 27 minutes played when he was booked for a trip on James McClean, a caution which meant he would miss the quarter-final should his side fight back to win. Long needed extensive treatment on the pitch after being caught by full-back Patrice Evra as the pair challenged for a loose ball on the sideline, although he was eventually able to continue. Republic midfielder Jeff Hendrick also needed treatment after catching Pogba’s swinging boot in the thigh, and he was roundly booed by the home fans as he limped off having gone to ground for a second time in some discomfort. Ireland managed to push their line further up the field as the half wore on, although the ball was too often refusing to stick and France were able to start building once again. But Duffy might have doubled the lead a minute before the break when he got his head to Brady’s free-kick, only to send his effort wide of the far post. However, it took stoppage-time blocks by Ward and Duffy to deny first Payet then Griezmann as France piled forward in search of an equaliser. Deschamps opted for change at the break when he replaced enforcer Kante with the fleet-footed Kingsley Coman, to the approval of the locals. But it was central defender Laurent Koscielny who very nearly levelled within three minutes of the restart when he glanced Payet’s free-kick towards goal, but saw the ball fly just wide of the far post with Randolph helpless. However, had Lloris not got a hand to James McClean’s low 52nd-minute cross after Brady, Murphy and Hendrick had combined to set him up, Long would have had a tap-in at the far post. But the traffic continued to head largely in Randolph’s direction and he was relieved to see Payet drag a shot wide of his far post seconds later. However, there was little he could do to preserve his side’s lead when Payet picked out Bacary Sagna in space wide on the right with 58 minutes played. The full-back’s cross was unerring and, for once, Griezmann was unmarked as he powered his header past the keeper to send up a huge sigh of relief from the home crowd. Ireland were undone once again just three minutes later as their dream started to slip away when striker Olivier Giroud climbed high to head the ball down into Griezmann’s path, and his left-foot finish gave Randolph no chance. The Republic’s afternoon was going from bad to worse, and they left themselves with a mountain to climb with 66 minutes gone when Griezmann got in behind the defence and was felled by last man Duffy, prompting the inevitable red card. 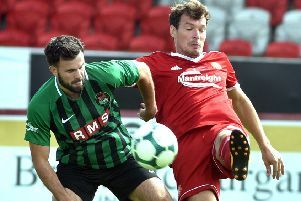 O’Neill’s depleted defence managed to deal with the resulting free-kick, but the manager responded by withdrawing McClean to send on central defender John O’Shea with 22 minutes remaining. France now go forward to meet the winner of Monday’s clash between England and Iceland.